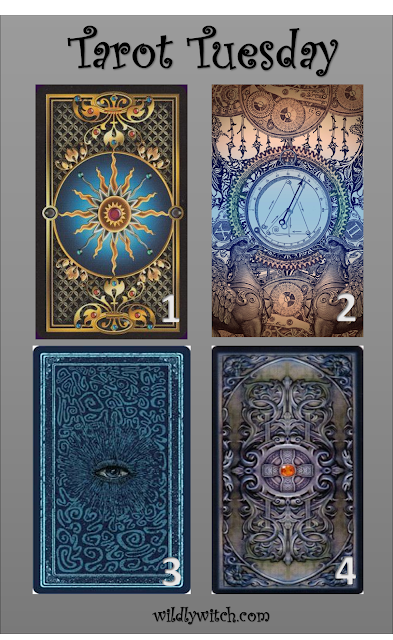 If you haven't done so, please select the card that speaks to you most. Now, let's get on with the reveal! 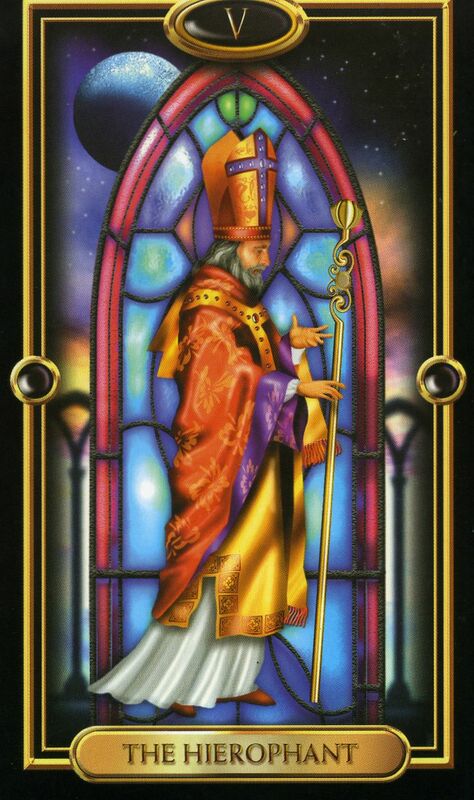 The Hierophant represents you following a new belief system. Perhaps you are volunteering for a political cause or attending religious services regularly after years of not doing so. The loss of some individuality in your life may be offset by the great feeling of being a part of something much bigger than yourself. Sticking to a new diet or workout routine is a manifestation of the conformity of the Hierophant card that is also self-improvement. Ritual of any kind is helpful to you now. The Hierophant is very much about "doing the right thing." You may be struggling with an issue and are unsure about what is "right" for you to do. Know that the answers are within you. Remember that the "right" thing is what is right for you, also. 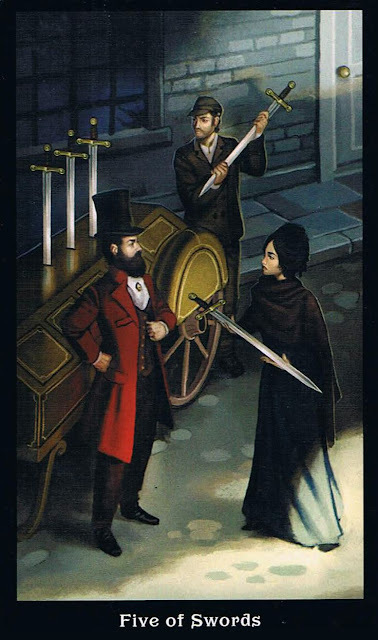 When the 5 of Swords appears, you are likely to find yourself with some mixed feelings about life in general, and about a few people in particular. Don't ignore these, but remember, this too, could pass. If you speak what's on your mind right now, you could ruin the very thing you want the most - close, intimate relationships. Think several times before you really let someone have it even if they deserve it. Choose your battles wisely today. In the context of work, this card may indicate that you can be your own worst enemy. Don't expect the entire system to be changed just because you believe it should be different. How you speak your mind is as important as what you say. There may be some unfairness at play in your work world. Be sure that your behavior is impeccable. 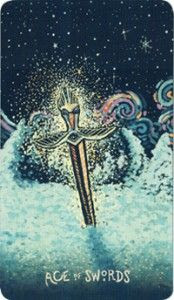 The Ace of Swords can indicate a new beginning of some sort in your life, possibly on several fronts. Sometimes this new beginning can be started by a separation - from a relationship, or from a job situation. Know that as anxiety-producing as such a new beginning can sometimes be, that underneath it all is good, beneficial energy that is getting you where you want to go. In general, the Ace of Swords calls on us to not be afraid to make a leap, if it's in our best interests. In short, bravery is called for. As the old adage says, "feel the fear and do it anyway." You have a good idea already of what must be done. The hard part is the doing of it. Start today.The Ace of Swords gives you the strength to confront situations that do not mesh with your understanding of things and the presence of mind to articulate your position. All of your hard work, devotion, and planning has finally paid off and it is well worth celebrating!If you have not quite reached this point of completion, you are very close! You need to attain a degree of understanding that enables you to graduate to a higher level and enjoy real success. This rare time of culmination must be identified and honored. Look at the past month / six months / year and think about how far you have come, and what you have achieved. You may be quite surprised at your progress! You may also see the projects you are currently working on have even better results than expected. 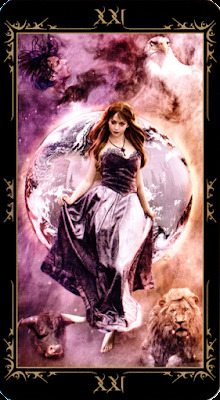 That's it for this Tuesday's Tarot. How did you do? Feedback is not only appreciated, but welcomed! Leave a comment here or on the Facebook page! I love interacting with you!